After I wrote a post about what to do with your dogs when you go on vacation, I thought about what to do with your horses when you go on vacation. Now of course there’s a lot more people who own dogs than own horses, and this post will only be a passing interest to non-horse owners. 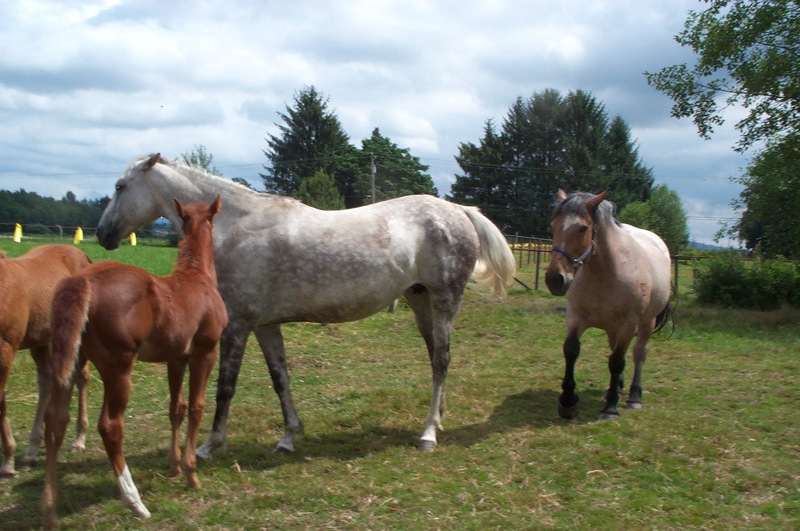 Horses require a lot more planning for their care if the owner takes a holiday. 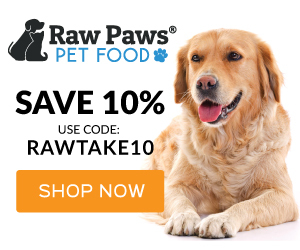 Dogs are smaller, can fit into cars, and can be easily transported to a kennel or join the family on vacation. Some owners board their horses at full care facilities. For you non-horsey people reading this, that means they pay a farm owner a lot of money to fully take care of their horse. The farm owner buys the hay and grain, feeds the horse, cleans its stall, and puts it in and out of the pasture daily. In other words, the farm owner has full responsibility for taking care of the horse. This is a good situation because the horse owner doesn’t need to show up everyday because they’re paying someone else to take care of their horse. The same goes when they want to take a vacation. They’re paying someone for full board on their horse, and they can go away and not worry about their horse because it’s being taken care of. Other people, like myself, keep their horse in a self-boarding situation. That means I pay the farm owner to keep my horse on their property. Everything else I take care of. I buy the hay and grain, I feed my horses, and I’m responsible for the horse care. I have to show up everyday to feed my horses, groom them, and check them over for injuries and illnesses. A similar situation is for people who live on farms. They’re fully responsible for their horse’s care. You just can’t up and go on vacation and leave your horses to fend for themselves. There aren’t very many options available to horse owners other than just not going on vacation. Or is there? 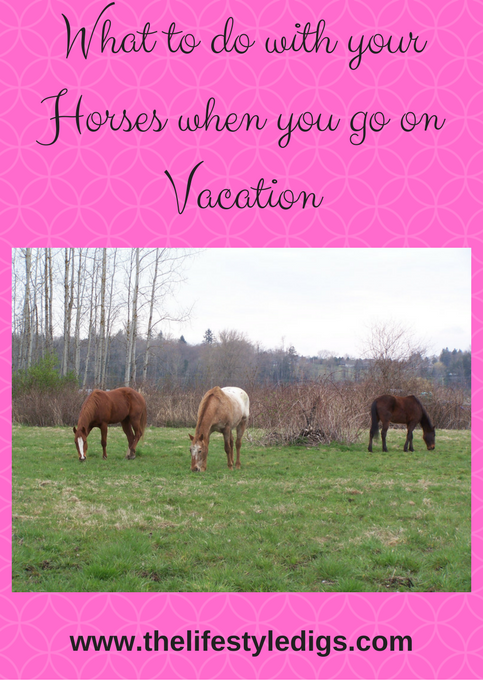 What can you do with your horses when you go on vacation? Take the horse with you. Don’t laugh. If you have a truck and a horse trailer, or access to one, there are places you can take your horse on vacation. 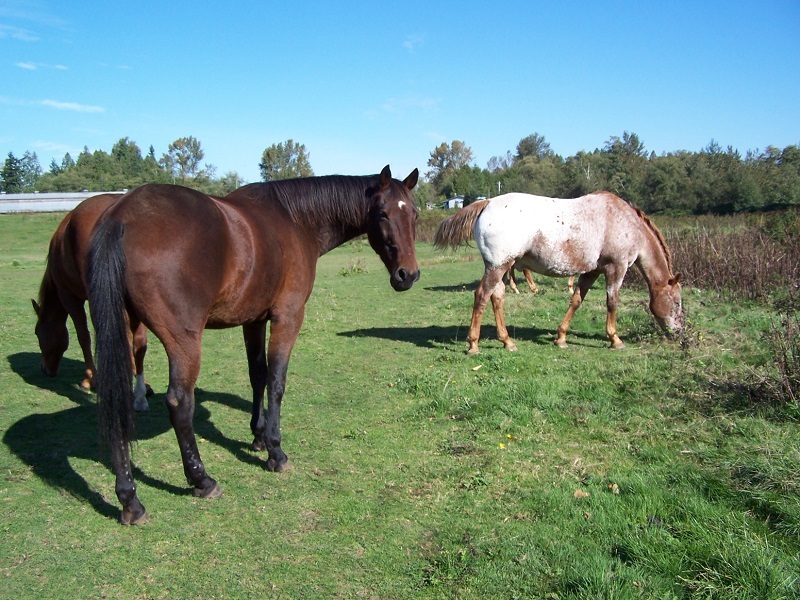 Skagit Valley Provincial Park near Hope, British Columbia has camping sites with horse corrals. There are also bed and bale guesthouses that welcome horses. 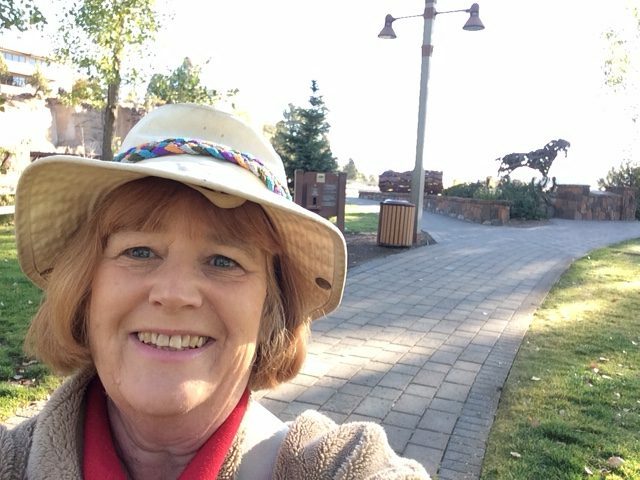 Do a search for the Backcountry Horsemen in your area and they’ll have links to campsites and accommodations where you can stay with your horse. Friends and family. This is probably the next choice, especially if these are people who live in your household, or don’t mind driving out to the place you board your horses to tend to them. Preferably these are people who know about horses, or enough to understand if a horse is in need of medical or emergency treatment. Trainer/Instructor. If you take riding lessons, perhaps your trainer or instructor can tend to your horse while you take a vacation. Farm owner. Even if you do self-boarding, often you can make arrangements with the farm owner to feed your horses, or if they’re turned out in a lush pasture, at least check them over each day to make sure they’re OK. You’re better off scheduling your vacation for times when the pasture is self-sufficient for grazing. Forget about a Hawaiian or Mexican vacation during the winter when horses need to be fed daily. Full board stable. If you do self board or live on acreage and are used to doing all the horse chores yourself, it can be tough to take your horse to a full board horse farm. Sometimes that’s the thing you have to do, depending on how bad you want to go on holiday. Your horse will be fed and monitored daily by professionals. Horse sitter. Ask around or check Craigslist or do an Internet search. There are business where experienced horse people will come out to your farm or your self board stable and take care of your horse. They charge per visit, and it can add up, especially if you have stalls to be cleaned. You’re paying a person for at least a minimum one hour plus their driving time and gas money. If you have several horses this might make economic sense. Otherwise the full boarding stable might be a better option. What do I do? I’m usually in the what’s a vacation category? I do take short trips when the pasture is growing sufficiently at the farm I board my horses at. Usually the grass is pretty good from March to November. Once we’ve had a hard frost or snow or freezing temperatures, the horses need hay or alfalfa daily plus their grain. I’m lucky that I live in an area where the pasture grows for most of the year. I’ve gone away for up to a week and worry about my horses the whole time. Do you have any other suggestions on what to do with your horses when you go on vacation? We don’t have horses, but my mother in law does. 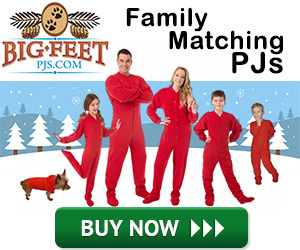 She does the friends and family when she’s gone….mostly family. I guess it’s only fair. We do use her horses! Your mother in law is lucky. Not all horse owners have friends/family to help out. Or the ones who could help live too far away! Horse sitting isn’t for everyone. My dad loves horses and my mom bought a new one for his birthday, now, they need to bring it to the farm. It was explained here that some pay someone else to take care of the horse. Moreover, for quality horse trailers for travelling it’s best to go to trusted suppliers. My sister loves horses and planning to buy one, but after a month she’ll be going on a long vacation. It was discussed here that there are full care facilities for horses where she can leave them while on a trip. Furthermore, it’s advisable to go to pet experts when planning to buy a horse for sale. Hi Vanessa, a pet expert when looking to buy a horse won’t be much use unless they’re a horse expert. I’ve never taken an “expert” with me when I’ve been looking to buy a horse. I have a lifetime of experience I draw on when making a decision.